Outdoor safety includes spotting danger before it's too late. He parked his car in Oakland CA as if it were disabled. When his first victim walked past, he punched her and shoved her into the back seat of his car. A male witness intervened, delaying the aspiring kidnapper just long enough for the victim to escape through a rear window. The kidnapper fled in his car. His second victim was waiting at a bus stop when he walked up and put a gun to her chest. He put his arm around her as if he knew her and began to “casually” guide her toward his car parked around the corner. She didn’t cooperate. She first dropped to the ground and kicked at the suspect, and finally ran away. The kidnapper returned to his car and fled. See Defensive-Ground-Kicks at Fighting Options - Strategies. • Any behavior changes as he comes near. • A hidden, motionless hand is unnatural when he walks. • Matches your moves: he stops and goes when you do. • “Sandwiches” you: two people approaching from different directions. Watch for distant people as they come near. Many criminals "telegraph" their intentions, such as crossing the street to intercept you, and quickly looking around for any witnesses. Watch for groups that split up to encircle you. Run toward safety while yelling for the police. So advises Kelly McCann, former U.S. Marine Corps Special Forces officer now of Crucible Security in Virginia. 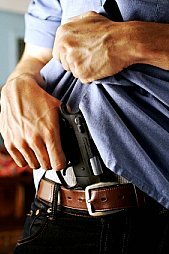 When a criminal reaches for a gun, it usually looks like he's reaching for his wallet with one hand – either from his back pants pocket, rear waistband, or the inside front of his jacket. If the gun is tucked into his front waistband, he'll probably use two hands – one to lift his loose shirt that's been hiding the gun, the other to grab the gun. Either way, by the time he gets the gun into position to fire, you can be already running away in full stride. Beyond extremely close range (0-3 feet is "point-blank range" and 3-9 feet is "close range"), handguns are very difficult to shoot accurately (unlike absurd TV shows and Hollywood movies). According to Sanford Strong, retired San Diego police SWAT team instructor and author of “Strong on Defense,” police officers miss with 75 percent of close-range shots while criminals miss with 96 percent of close-range shots. And a moving target is extremely difficult to hit. 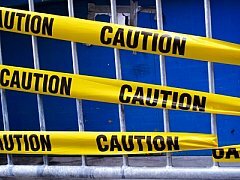 Besides, according to J.J. Bittenbinder, Chicago police detective and author of “Tough Target,” US DOJ stats show there’s only a 12 percent chance that a criminal will call attention to himself by firing a gun in a populated area (at any range) and only a 3 percent chance of hitting you fatally. Finally, think about it - if an attempted kidnapper is willing to kill you on the spot, he's likely to do worse as he kills you more slowly in a secluded spot of his choice. However, knives are more easily hidden, more quickly drawn, and have no “loudness deterrent” because they are silent. Still, throw down your wallet as you run away. For complete details, see Kidnapping and Kidnap Survival. • During the crime, notice clothing and hair, though they can be changed. Especially notice things a criminal can’t change, such his lips, teeth, eyes, nose, and walk. • Afterward, write down a description to fix your thoughts before you talk to anyone. • Insist on open-ended questions from police interviewers. Don’t allow visual aids like photos or logs of facial components if you’re questioned for a composite sketch. • Tape-record your police interviews to ensure that you’re not misquoted. You have the right to obtain the written police reports to compare with your tape. See After Being Attacked – Immediately Call the Police in Victims Options - Fighting. • Pumping you for information. • Leaving a possible bomb – any package or vehicle – near a possible target, such as a main building or crowds of people. • Remember descriptions – especially a car’s license plate numbers. • Notify the police IMMEDIATELY! Deter a predator by carrying a Personal Security Alarm (screamer or noisemaker) & Pepper Spray in plain sight. Those pages show you how to most effectively use them when spotting danger.